and know what's going on? MV Agusta Australia has a goal. It is to inspire MV enthusiasts and new riders of the brand to experience their Motorcycle Art in the flesh and on-board out on the road! 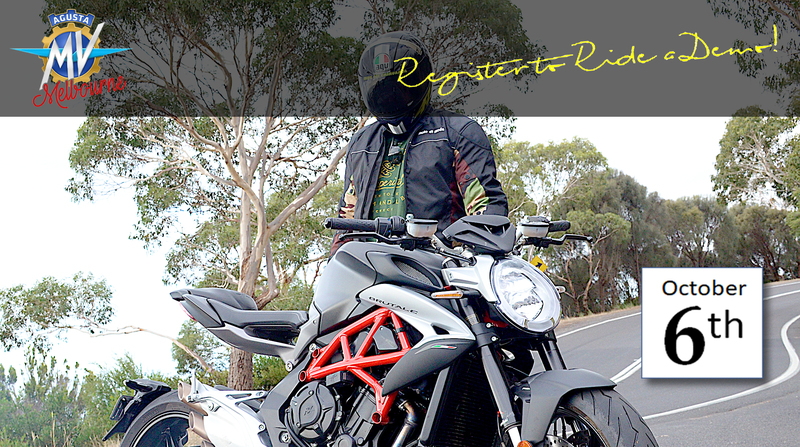 The National MV Agusta Riding Experience is an event like no other, with hundreds of test riders taking to the hills, valleys and countryside of Australia on a new MV Agusta motorcycle. The Melbourne Riding Experience location is King Lake Victoria, on Saturday October 6th, and will have a designated riding route providing participants with the opportunity to properly enjoy their motorcycle in a controlled and picturesque environment. Upon arriving for the day, registered participants will be formally introduced to the MV Agusta range and be briefed on the motorcycle before being lead out on a group ride by a lead rider and return later to enjoy light refreshments. After registering, you will receive a call to confirm your booking and riding time. As always, these spots are limited; to avoid the many disappointments of last year, BOOK IT IN YOUR CALENDAR and do not forget! We look forward to introducing you to this once-in-a-lifetime experience (before you decide that you need to own one and join the MV Agusta riding crew)!